Got a bouquet of cut flowers? Keep it looking fresh. 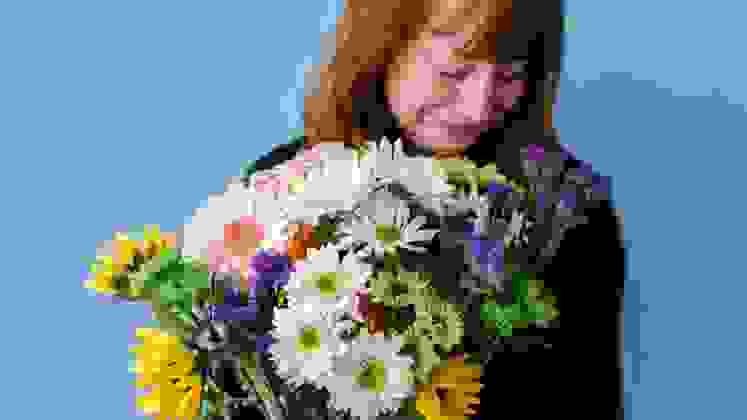 Whether you clip hydrangeas from your back yard, buy a bunch of daisies from the supermarket, or receive a romantic gift of red roses, you know that the stunning bouquet in your arms will be droopy and brown in no time. Yes, flowers have a “vase life”, and it’s not forever. Obviously, it's no great loss if a $10 supermarket bouquet wilts in a few days. But Valentine roses can cost $60 a dozen. You want to be able to enjoy the gift for as long as possible. Let me admit right off that, historically, I have not had much luck with flowers. Whenever I was fortunate enough to receive a bunch, it died within a couple of days. I once told my husband not to buy me any more flowers, because I get sad when they die. (Luckily, he didn’t take me seriously. I don’t think.) But I recently picked up a few floral pointers. Would I now be able to make cut flowers last? How long can flowers stay alive? 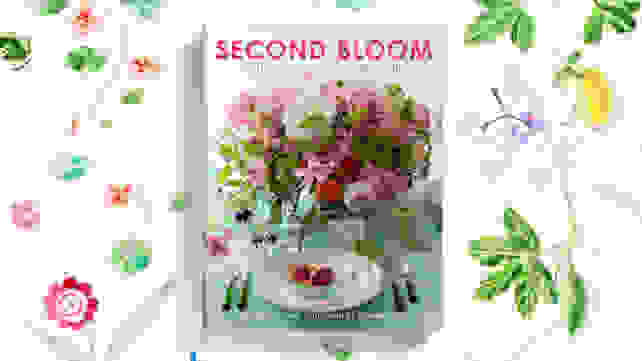 Advice from floral guru Cathy B. Graham in the book Second Bloom: Cathy Graham’s Art of the Table convinced me that it might be possible to keep flowers looking fresh and beautiful for a longer time. If you “condition” the flowers before you arrange them, Graham says they can last a week or more. Cathy B. Graham's book is full of stunning images, with tips on keeping flowers fresh. Her floral arrangements are whimsical, fun, and creative. Start with fresh flowers—cut or buy them first thing in the morning. Keep flowers in a cool place, out of direct sunlight. Don't leave dead flowers in the vase. Cull the flowers every day, and remove the ones that didn’t make it. These flowers are waiting to be conditioned. Fill a clean bucket about a third of the way with room temperature water. Strip the leaves off the stems. Any leaves left below the surface of the water will cause bacterial build up. Every day, trim an inch off the stems at a 45° angle. Cutting the stems helps the flowers to sip. 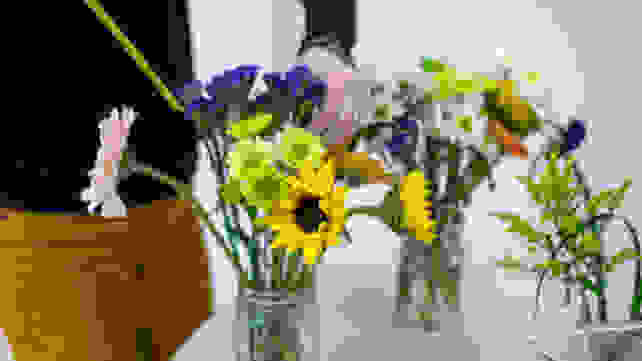 Put each flower in the bucket as soon as soon as you cut the stem. Let the flowers drink from the bucket for several hours before moving to a jar or vase. Fill each jar or vase halfway with water. You can add a few drops of bleach to the water in the vase unless you have pets who might drink it. Clean the vase carefully every day, and refill it with fresh water. Here's what our flowers looked like on the first day of our test. To see how effective this method is, we decided to try it. We bought two identical $10 mixed bouquets from Trader Joe's. 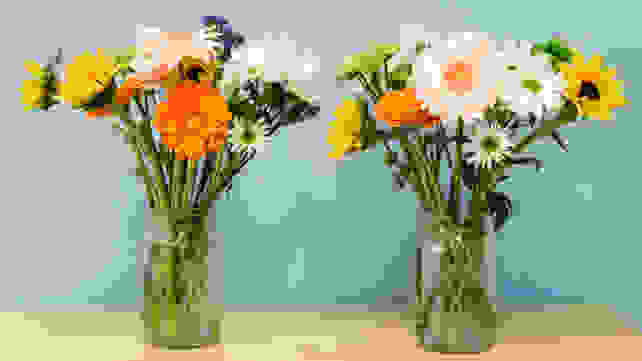 Each bunch consisted of white daisies, pink and orange Gerbera daisies, green chrysanthemums, yellow sunflowers, and a branch or two of purple statice. We removed leafy filler because the focus was on the flowers. Every day, we clipped the stems to allow the flowers to drink. Using a sharp knife, we cut the stems at an angle and let the flowers soak in a clean bucket of water for several hours. We then placed each bouquet in a separate Mason jar with water. To see how much of a difference the daily conditioning would make, we left one bouquet alone for a week, to serve as a control. With the other bouquet, we clipped the stems, scrubbed the jar, and changed the water daily. At the end of the week, we compared the two bouquets. The flowers on the left were conditioned—we clipped the stems (that's why they're so short) and changed the water daily. 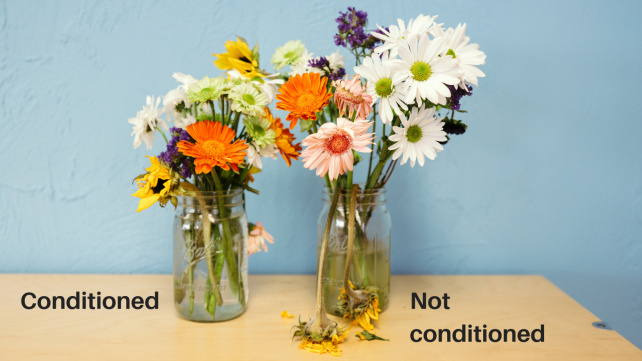 The flowers on the right we basically ignored after putting them in the jar of water. More of the untreated flowers died, but the ones that lived look about the same as the conditioned bouquet, just taller. Honestly, our two bouquets didn't end up looking vastly different by the end of the week. Neither looked perfectly fresh, but more of the flowers stayed alive in the conditioned bouquet. The conditioned flowers were also much shorter because we clipped the stems every day. If you're going to condition your flowers, have a smaller container at the ready. Trust me, you'll want to rearrange the shorties as they shrink. At the end of the experiment, we counted the dead flowers in each bouquet. Our control bouquet ended up with five dead flowers—one pink Gerbera, two sunflowers, and two chrysanthemums. 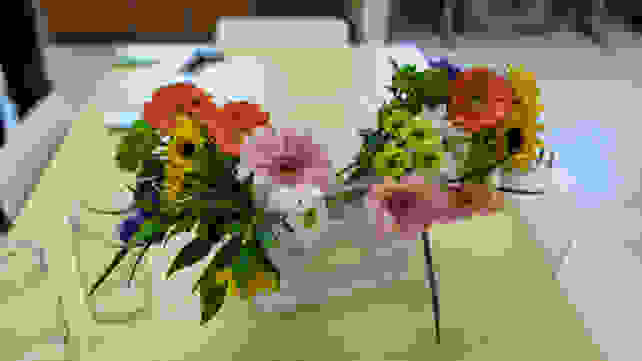 After all that work, our conditioned bouquet had only three dead flowers—one pink Gerbera, one sunflower, and one chrysanthemum. Is that extra life worth it to you? It depends, but the method at least shows promise. While most of the flowers in our bouquets made it through the week, one surprising winner emerged. At the end of the experiment, the simple white daisies looked best—even (especially) the ones in the untreated bunch. Daisies are cheap and low maintenance. If you want a cheerful bouquet that will last a long time, buy some daisies. Don't even bother to condition them—they really don't need it.